Gleði - Hamingja - Kærleikur frá Heimahaga is very promising mare, daughter of the great mare Krít frá Miðhjáleigu and Konsert frá Korpu (8.61). Sparta frá Heimahaga is very promising mare, daughter of Hrymur frá Hofi (8.28) and Dröfn frá Stað. Sparta is syster of Krít frá Miðhjáleigu, same father and same mother. Mjöll - Gnjöll frá Heimahaga is a promising son / daughter of Gjöll frá Skíðbakka (8.24) and Gnýr frá Árgerði (8.02). Lind frá Heimahaga is Daughter / Son of Framherji frá Flagbjarnarholti (8.27) and Berglind frá Húsavík (8.20). Tangó frá Heimahaga is a promising daughter / son of Framherji frá Flagbjarnarholti (8.27) and Sveifla frá Geirmundarstöðum. Frami frá Heimahaga is Son of Framherji frá Flagbjarnarholti (8.27) and Kylja frá Hamrahóli. Úlfur / Úlfhildur frá Heimahaga is a promising mare with great movements and spirit. She has good bloodline, daughter of Kjerúlfur frá Kollaleiru (8.44) and Evelyn frá Litla-Garði (8.19). Sléttuúlfur frá Heimahaga son of Kjerúlf frá Kollaleiru (8.44) and Skreyting frá Kanastöðum (7.93). Úlfar / Úlfhildur frá Heimahaga is a promising mare, daughter of Kjerúlfur frá Kollaleiru (8.44) and Hríma frá Svalbarðseyri. 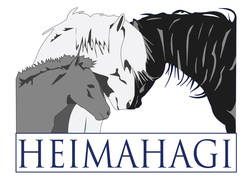 Sólarhringur - Stjarna frá Heimahaga is daughter / son of, the four gaited stallion, Hringur frá Gunnarsstöðum (8.09) and Sólný frá Hemlu II (7.97). Leikur - Líf frá Heimahaga is son / daughter of Leiknir frá Vakurstöðum (8.28) and Fífa frá Meiri-Tungu 1 (8.0). Barri - Glæða frá Heimahaga is Daughter of Garri frá Miðhjáleigu and Brana frá Reykjavík.